Keyring for webOS stores your account information securely, so you don't have to rely on your memory, or on little scraps of paper. Sensitive data are encrypted using the Blowfish algorithm, and protected by a master password. Supports import/export to URL, file or clipboard. A Java utility is available to convert from CodeWallet, eWallet, GnuKeyring and CSV formats. 0.3.0 Improved item creation, bugfixes, new icon. 0.2.0 More secure data storage. 0.1.3 Workaround a bug in webOS 1.3.5 affecting category import. 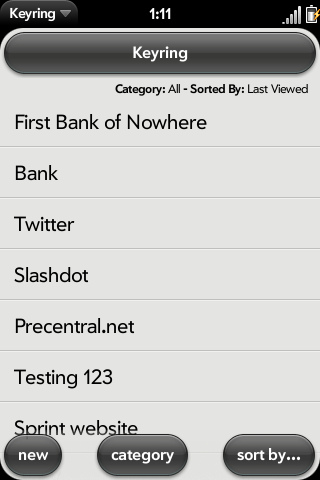 0.1.0 Categories, display improvements, bugfixes. Java utility for import from PalmOS now available. 0.0.6 Fixes dumb bug in initial setup. 0.0.5 Fixes "create new password" bug at launch, adds option to require password at launch, minor bug fixes and features.